FAYETTEVILLE, N.C. -- Matthew was long gone from the Atlantic coast early Monday, but the devastation lingered, most notably in North Carolina, where flooded cities tried to dry out and those downstream kept a close eye on rising rivers. The flooding disaster is forecast to slowly unfold over the next several days as all that rain - more than a foot in places - flows into rivers and downstream, likely causing more inundation in many of the same places devastated by a similar deluge from Hurricane Floyd in 1999. Thousands of people found themselves suddenly trapped in homes and cars during the torrential rains. Rescuers in Coast Guard helicopters plucked some of them from rooftops and used military vehicles to reach others, including a woman who held onto a tree for three hours after her car was overrun by flood waters. The storm killed hundreds of people in Haiti and at least 19 in the U.S. - nine of them in North Carolina. Most were swept away by flood waters. At least five people were still missing early Monday, all in North Carolina. That state’s governor, Pat McCrory, said Sunday that authorities feared they may find more victims. 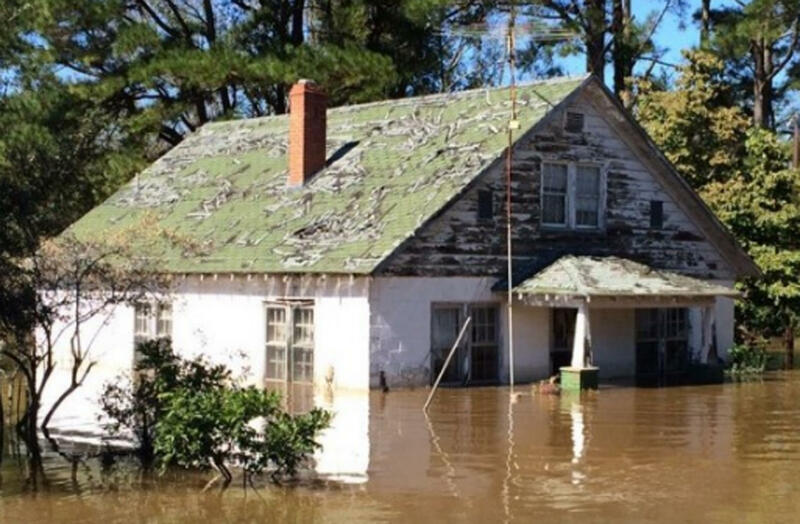 Princeville, a town of 2,000 that disappeared in the waters of the Tar River during Floyd, was evacuated Sunday as the river was expected to rise to 17 feet above flood stage by late Monday - a level not seen since Floyd. McCrory expected more evacuations as some rivers were predicted to crest next Friday. David Bullock’s sister called him as he bought lottery tickets to tell him police were knocking on doors saying they had to go. He rebuilt his home after the 1999 flood. “If I get flooded again, I can’t take it. I can’t go back and take the expense. If I get flooded again I’m going to say, ‘It’s yours, I’m gone,”’ Bullock said. More than a million homes and businesses in South Carolina and North Carolina were without power, and at least four separate sections of Interstate 95 - the main artery linking the East Coast from Florida to Maine - were closed in North Carolina. Some customers could be in the dark for a week in North Carolina, says CBS Raleigh affiliate WNCN-TV. The station reports a dam in southeast Moore County, southwest of Raleigh, is at “extreme risk”’ of failure, due to pressure from Matthew flood waters, according to the National Weather Service. Residents along Crane Creek and the Lower Little River were either notified of the dam’s status or evacuated. Already widespread flooding across Cumberland County would be worsened by the dam’s failure, the weather service said. If the dam fails, Fort Bragg, Pope Air Force Base and Spring Lake could experience flooding. In Wilson County, rescuers were called when a 63-year-old woman didn’t make it home from work. They heard her cries for help while riding on top of a Humvee, and when they couldn’t get her with a rope, a National Guard soldier swam to her, staying until a rescue boat arrived, Emergency Management Director Gordon Deno, said. Even animals had to be saved. One TV station in Raleigh showed a dog swimming around floodwaters Saturday. McCrory said he and his wife were riveted by the coverage and relieved to find out from the Coast Guard that the dog managed to get into a tree and they rescued it. The rainfall totals were staggering: Nearly 15 inches in Fayetteville and 8 inches in Raleigh. McCrory warned that cities along rivers in eastern North Carolina needed to be prepared for days of flooding. The Lumber River in Lumberton was 4 feet above its record level Sunday afternoon and was forecast to remain there for at least five days. Shortly before daybreak Sunday, the hurricane was downgraded to a post-tropical cyclone. As of 2 p.m. ET, the storm was centered about 150 miles east of Cape Hatteras, North Carolina, moving out to sea. It still had hurricane-force winds of 75 mph. Elsewhere along the Atlantic coast, things were slowly returning to normal. Much of Savannah, Georgia, which had 17 inches of rain, was still without electricity. About 150 people stood in line for a grocery store to open like it was a Black Friday sale. Matthew sideswiped hundreds of miles of the U.S. coastline from Florida through Georgia and the Carolinas, its eye staying far enough offshore that the damage in many places along the coast was relatively modest, consisting mostly of flooded streets, flattened trees and blown-down signs and awnings. A shift of just 20 or 30 miles could have meant widespread devastation nearer the ocean. In addition to the nine deaths in North Carolina, there were four in Florida and Georgia and two in South Carolina. Some were killed by falling trees, others by carbon monoxide fumes from a generator. One 66-year-old man near Columbia, South Carolina, died at a nursing facility when he got pinned under his electric wheelchair in water after the heavy rains. “People were hit. They weren’t hit as directly as we had feared, but it has left a lot of devastation in in its wake. Lives have been lost, property has been severely damaged and there’s still continuing risk of flooding going on,” President Obama said at a fundraiser in Chicago.